The 51st Annual African American Heritage Parade & Festival kicks off on Friday, May 25th for a weekend of fun for the entire family! 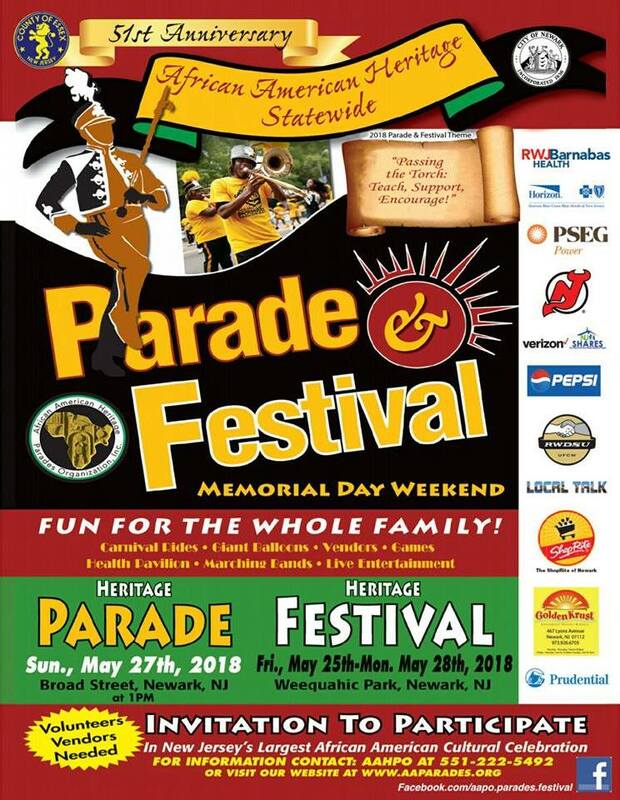 The Memorial Day weekend festival is located at Weequahic Park and will have carnival rides for all ages, pony rides, games, vendors, health pavilion, Kids Zone, and live entertainment. On Saturday, May 26th, there will be a spectacular fireworks show at Weequahic Park starting at 10:30pm. Sunday, May 27th, will feature the annual Heritage Parade starting at 1pm. The parade will march down Broad Street in downtown Newark and will have marching bands, floats, and more. Vendor information can be found at the AAParades website’s vendor page. Info on participating in the parade can be found at this page on AAParade’s website.